Beyond the commonly heard refrain that the Great Recession has ushered in a new, larger educated service class, which turns out to be largely untrue, another common worry is that of the type of migrant (or degree field, like STEM, humanities, etc) that cities attract. Is your regional economy attracting enough of the “good” degrees? Well, what constitutes “good” is certainly open to interpretation. However, below I compare educational attainment, degree field and migration across the largest MSAs in the country. I use the IPUMS-USA 2013 ACS micro data. Due to data limitations, I use only in-migration (and rates) and not net migration. This is unfortunately but also something I cannot readily fix at the moment and the two measure are highly correlated in most cases. Additionally this is just one snapshot in time. The first graph shows there is a positive relationship between local educational attainment and in-migration rates of college graduates. 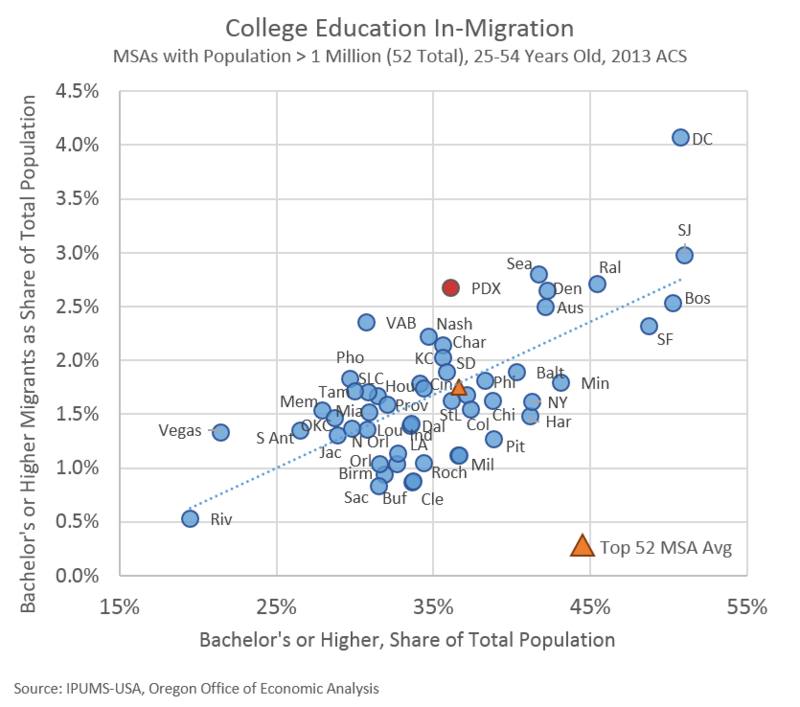 What’s interesting here from a Portland perspective is that PDX’s migration rates are equal to cities with much higher educational attainment. Overall Portland is pretty average in terms of educational attainment, relative to other big cities, however our migration trends are very strong. The second graph divides the college graduates into two camps: those with a Business, STEM or Health degree and those that have a degree in a different field. This is a rough cut to separate degrees and while not perfect, does provide a reasonable starting point. I think. Here, Portland has an above average concentration of All Other degree and a below average concentration in Business/STEM/Health degrees. This result is very similar to previous work done by EcoNorthwest for the Portland Business Alliance. Note: You add together the x and y-axis values to get total bachelor’s or higher share of population. Third, combining these two calculations shows in-migration rates by broad degree group across the largest metros in the country. Here is easy to see which cities have high (or low) migration rates. 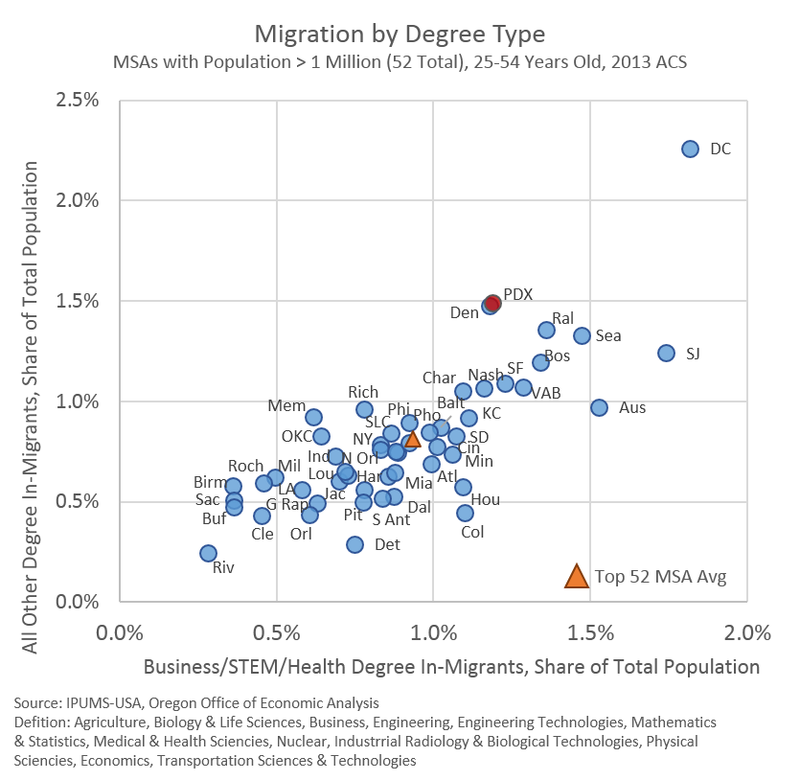 Portland is significantly above average for both broad degree groups (5th highest in-migration rate overall). Although it is weighted more towards the All Other. 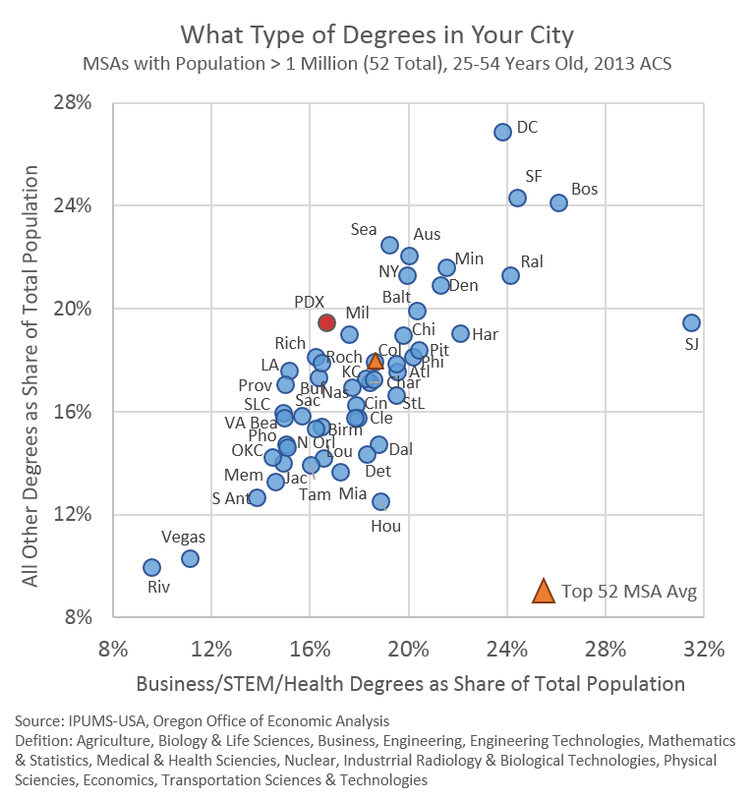 For those that are worried about degree field, the good news is that while Portland is currently below average for educational attainment in Business/STEM/Health degrees, the growth and migration differential is such that ground is being gained on the other large metros. Apologies for the death by scatter plot. This post initially included some additional state level work on jobs requiring a degree vs those that do not. Our office will continue to work on this topic and republish it, along with a better, more clear explanation of what our findings really show.